SmartCloud Control Desk is a comprehensive IT Asset and Service Management solution that helps reduce cost and minimize service disruptions. It does so through automated service request handling, efficient change management, and optimized asset lifecycle management across IT and enterprise domains. SmartCloud Control Desk helps to reduce total cost of ownership by using one unified solution to license, install, and manage multiple ITIL processes under one price point. It can also help reduce business risk by using advanced impact analysis and defining automated change procedures that ensure integrity of existing infrastructure while supporting business agility. SmartCloud Control Desk improves efficiency and quality of service by unifying asset, change, and problem management. It lowers cost and mitigates license compliance risk by performing end to end software asset management. It also delivers an adaptive, role-based simplified UI that can be more intuitive for novice users, which reduces training costs, while allowing access from anywhere at anytime through mobile device support that includes BlackBerry, iOS, and Android. In addition, SmartCloud Control Desk supports both a profit center business model for internal IT organizations, and an external Service Provider model. It allows organizations to manage customers and customer agreements and bills for managed assets, usage, and work activities while improving utilization rates and reducing unnecessary purchases by managing the IT asset lifecycle. You can deploy SmartCloud Control Desk in a variety of ways; traditional on-premise, SaaS, VM image. This approach can make it more affordable to meet your current business needs, and seamlessly move between delivery models while keeping the same functionality. 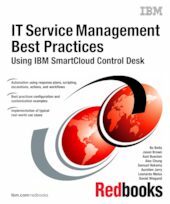 This IBM® Redbooks® publication covers IBM SmartCloud® Control Desk product configuration, customization, and implementation best practices.